Available for Linux kernels 2.6.32 and newer. No need to patch the kernel: just load the kernel module. User-space ZC (new generation DNA, Direct NIC Access) drivers for extreme packet capture/transmission speed as the NIC NPU (Network Process Unit) is pushing/getting packets to/from userland without any kernel intervention. Using the 10Gbit ZC driver you can send/received at wire-speed at any packet sizes. 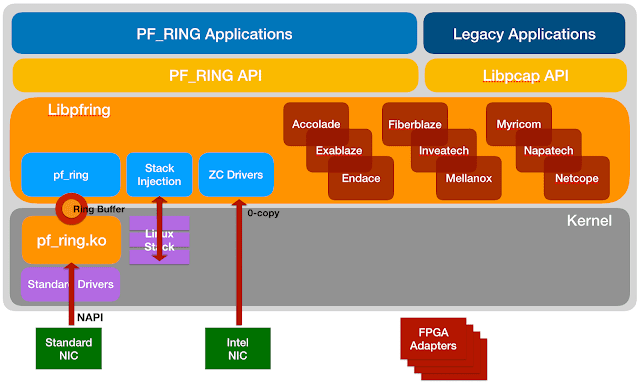 PF_RING ZC library for distributing packets in zero-copy across threads, applications, Virtual Machines. Support of Accolade, Exablaze, Endace, Fiberblaze, Inveatech, Mellanox, Myricom/CSPI, Napatech, Netcope and Intel (ZC) network adapters. Kernel-based packet capture and sampling. Libpcap support (see below) for seamless integration with existing pcap-based applications. Ability to specify hundred of header filters in addition to BPF. Content inspection, so that only packets matching the payload filter are passed. PF_RING™ plugins for advanced packet parsing and content filtering. If you want to know about PF_RING™ internals or for the User’s Manual visit the Documentation section.